Sound (9.2/10) – The VC1000, like VSonic’s pricier GR01 model, is based on the popular TWFK dual balanced armature transducer from Knowles, and offers a balanced sound signature and overall performance on-par with the GR01. Its bass is tight and level, about even in quantity with the Fischer Audio DBA-02 mkII. Both depth and punch are good for a balanced-sounding BA-based earphone. The midrange is likewise level and not clouded or veiled by the bass in any way. The VC1000 sounds a little warmer and fuller than the similarly-priced Rock-It Sounds R-50 and is again more akin to the Fischer Audio DBA-02 mkII and the VSonic GR01. Next to the R-50 its mids are thicker and more filled-in. It is still less warm and thinner-sounding than the dynamic-driver VSonic GR07, however, presenting its midrange in a decidedly BA-like fashion. The top end of the VC1000 is a bit more forgiving compared to the DBA-02 and Rock-It R-50, again reminding me of the GR01. The R-50 especially sounds brighter and harsher in comparison unless modified with aftermarket eartips and an inline impedance adapter. The treble of the VC1000 is also a bit smoother and less sibilant than that of my first-generation GR07, and more refined and extended than that of the single-armature MEElec A161P. The VC1000 also sounds airier than the more intimate A161P. In general, its presentation is similar to other TWFK-based sets. It lacks a bit of soundstage width next to the Rock-It Sounds R-50 but sounds plenty spacious and well-rounded overall. The RE-400 is a dynamic-driver monitor with a neutral-to-warm sound signature. Compared to the VC1000, its sound is warmer and fuller and its balance is more mid-centric. The VC1000 carries very similar overall bass punch but sounds a bit thinner in the midrange. It is also brighter, with significantly more treble energy than the RE-400. The HiFiMan set is smoother, but also a bit dull-sounding in comparison. In a way, the VC1000 sounds more balanced and complete due to the added treble intensity, but is also less forgiving and on some tracks less natural overall. The presentations of the two earphones are equally capable, with the VC1000 having a very slightly wider soundstage. The optimal choice between the more forgiving and mid-focused RE-400 and the brighter, more crisp-sounding VC1000 will definitely depend on the listener. Another balanced-sounding dynamic-driver earphone, the S1 reminds me in many ways of VSonic’s pricier dynamic-driver sets. Compared to the VC1000, it boasts more bass, especially deep bass, and has a warmer overall tone. While less powerful, the low end of the VC1000 is tighter and a bit clearer and its midrange is more prominent in comparison. As the HiFiMan RE-400 sounds more mid-centric compared to the VC1000, so the VC1000 sounds more mid-centric next to the Fidelio S1. Interestingly, while the VC1000 boasts similar, or even slightly greater, treble energy, it actually does a better job of keeping its treble smooth. The Fidelio S1 appears a little harsher and more peaky in comparison and tends to be even less forgiving than the VC1000, which itself is not exactly smoothed-over. Long-renowned for its accuracy, the ER4S remains the fidelity standard for many listeners. The performance of the more reasonably-priced VC1000 falls in the same ballpark, offering up a slightly less neutral – but still well-balanced – sound. The VC1000 has fuller bass, boasting a bit more impact, while the ER4S sounds thinner. The Etys have more forward upper mids and as a result appear to be a little clearer. The upper and midrange and treble sound a little more accurate and refined with the Etys, while the VC1000 is a bit more splashy and sibilance-prone. Overall, the two earphones really aren’t very far apart – those concerned with bass will be happier with the VC1000 but otherwise it’ll come down to preference – and budget. Value (9.5/10) – Yet another competitive monitor from VSonic, the VC1000 uses the familiar TWFK formula, taking advantage of the drivers’ small size and capacity for accurate sound. Unlike the similarly-priced Rock-It Sounds R-50, which required some minor modification, I was impressed with the sound of the VC1000 right out of the box. It has more going for it than just the sound, too – the slim form factor is very comfortable and the construction is good as well. The earphones utilize a simplified design that gets away from some of the quirks of VSonic’s GR01 and VC02 models. All in all, the VC1000 is a lower-priced – but not less capable – alternative to the GR01 and a very solid earphone for those who tend to prefer a flatter sound signature. I’m looking for an iem in a similar price range and with a similar build but with slightly more bass compared to the VC1000s. Does such a thing exist? If so, what is it and where can I find it? Thanks. P.S. The build is a lot more important since it will be used with a motorcycle helmet. That would be tough, and definitely wouldn’t happen in a similar price range – the VC1000 is among the most balanced and resolving earphones I’ve heard to date, and you invariably start to give some of that up when you start upping the bass unless we’re talking about one of the $1000+ top-tier custom earphone that actually manage to give you both (e.g. the Hidition NT 6). Keeping things reasonable, your best bet to keep the clarity and other strengths of the VC1000 while also getting more bass would be a top-tier “Hybrid” BA+dynamic set. My choice would be the FLC Technology FLC8, but there are other good options such as the DUNU DN-2000. DN-2000 probably won’t fit under a helmet but the FLC8 is pretty ergonomic (despite its unusual design) and should work. If you want to keep things under $200 then you might as well accept that you’ll be giving up some of the refinement and resolution of the VC1000 and get a VSonic GR07 Classic for $99. Hi, my brainwavz b2 just got broken 🙁 looking for a replacement here within the same price range. I think vc1000 will be great for me, based on your description of its similar warmth to b2 but with slightly smoother treble. But it seems TWFK’s are pretty hard to find these days, may I know if you have other suggestions? I’m afraid re400 might be too smooth for me and with not enough bass extension, and gr07 and Fidelio series might have too hot treble. Do you think the gr07 classic wouldn’t be so sibilant though? I basically fell in love with the TWFK’s resolution and the magical upper mids extending to the highest frequencies. Sorry for being so picky but I got really spoiled with how the B2 sounds so top tier without being so expensive. I totally appreciate your suggestions. It’s not a 100% match for the VC1000 or B2, which are two earphones that I think are absolutely magical in terms of what they can do across the entire frequency spectrum, but it’s the closest set in overall performance I can think of and has some strengths of its own (the bass is nice and full-bodied for a BA, for instance). Two alternatives if you don’t want to spend the $160 on an IM02 – the Etymotic Research HF5 and Final Audio Heaven II. These are single-driver earphones and while they don’t quite have the linear response of a TWFK across the entire spectrum, they are very still excellent earphones for the price. The HF5 has excellent mids but is a little weak at the extremes while the Heaven II is a little harsher than I’d like (still not as bad as a GR07 though). Either way, they’re both a better match for the B2 than the other sets you’re looking at. Hiya Joker, I just saw these on Penon Audio. Did Vsonic choose to resurrect these or do you think they’re just left over stock? False alarm, I should have ordered them when I first saw them, they’re gone now. yeah, in that case it was definitely old stock. Darn. What would be a close replacement for the VC1000 in a similar price range? I lost mine and they are not available anymore. I am currently looking at GR07 and ortofon e-Q5. Unfortunately the true equivalent IEMs such as the Brainwavz B2 and Rock-It R-50 have also been discontinued so you’ll have to settle for something with a slightly different sonic flavor. The e-Q5 would be good, better than the GR07 for what you want. Final Audio Heaven II is an option as well, one that’s a little brighter than the Ortofon and even more similar to the VC1000 in sound sig. Etymotic HF5 would also be a decent choice, albeit with a touch less bass punch than these others. Or you could wait it out for the next generation of TWFK earphones – the next Rock-It sounds or Fischer Audio DBA-02. Supposedly they are coming out this year. Yes, the e-Q5 is a pretty smooth earphone compared to the VC1000 and other TWFKs. Not to the point of being dull, though. The Heaven II is brighter than the e-Q5 and more similar to the VC1000 in that regard. It can be a bit harsh, but not too bad. TFWKs can be similarly harsh. Agreed. I’ll sign the petition for the VC1000 mkII :). These things broke on me so easily. Had them for maybe a little over a week and theft ear phone went out. A lot of static for some reason. These weren’t what I expected. I like the slim and small size of phones like these but they’re very fragile. I had purchased sony mdr-ex600 entirely based upon your review for its bang for buck status , and enjoying its open sound since then. Now want to foray in to the BA IEMs considering ,they will sound good with vocals from artist like Norah Jones , Amber Rubarth. What would be bese bang for buck for this purpose with non-fatiguing highs. Does the ~thrice the price justifiable . T-Peos Altone200 – Are they really worth the trouble of getting from not so known seller . Zero Audio Carbo Tenore DX200 – Did you had a chance to listen them , it seems they are also good on detailing. Or the new Westone W20 , Westone UM Pro20 . would it be better if I save on iem side by going with vc1000 and get some decent amplifier in future. Currently using Fiio E10 and Fiio X3. The Altone200, VC1000, and even DN-2000 can be considered brighter earphones (especially the Altone). Depending on your treble tolerance they might not qualify under “non-fatiguing”, since you’re singling out that trait. I haven’t tried the Zero Audio or the UM Pro20 but the ER4S and W20 are nice reference-level BA earphones. There are people who find even the Etys fatiguing, but thats pretty rare. They are a little smoother in the highs than the three mentioned above and almost as smooth as a W20. However, if you’re looking at the W20 you might as well look around for a TDK BA200, which has a similar type of neutral-to-warm sound but is cheaper and arguably better. No real need to get an amp for the VC1000 with your sources. It’s not worse than the others listed above without an amp just because it’s cheaper. More of a sound signature thing – for some people I recommend it over much more expensive earphones, whereas for others even at $120 it just doesn’t fit the bill. Does the headphone have potential to break seal while lying down? I listen to music in bed a lot and am curious if the length of it would be an issue at all. Yes, they are quite long so unless you have large outer ears you probably won’t be able to lay down on your side without disturbing the earphones. Sorry I meant for lying on my back. Still an issue? I only ask since I can see the weight of the headphone being problematic because of how long and thin it is. Shouldn’t be a problem, then – they’re very light. The seal will keep them in place. I owned the VC1000 but sold them , to invest in CA M1 – it was a good decision! Remember the sound signature of VC1000… Loved them! 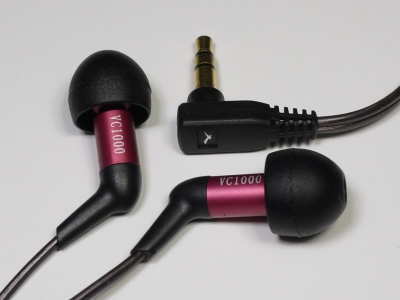 Now I’m thinking about GR07 , for “grab & go” IEM – is it have a wider soundstage than VC1000? Reading the reviews – I’m afraid of GR07s sibilance. I’m very sensitive about it… Thanks! It doesn’t sound like the GR07 is the right choice if you’re very worried about sibilance. Compared especially to the CA Music One, it’s just not as smooth. Even the VC1000 is a bit more forgiving. Yep, I suppose that these two IEM sounds different. Just to clarify, if I’m too sensitive for sibilance, you recommend to obtain the VC1000? You already owned the VC1000 and enjoyed it so I don’t see why not. I’m only saying the GR07 is a little more prone to sibilance than the VC1000 and even more so than the smoother CA Music One. Oh, and two more small questions. Are there any foam tips out there that are compatible with the VC-1000? And would you suggest getting ear guides if you’re planning on using these over the ear? Any recommendations on which kind or are any generic ones off eBay good enough? Glad you like them! BA earphones don’t really benefit from burn-in so short of getting more accustomed to the sound and experimenting with the fit, you’re pretty much getting what you’re going to get. Next step up would depend on a number of factors, like what you want to improve on and what you’re willing to sacrifice. If clarity remains a strong priority I would say at the “low end” you’re looking at something like the Dunu DN-2000 ($300) for an upgrade. The DN-2000 is a hybrid earphone and adds a dynamic driver for that deep, powerful subbass while maintaining the clarity, imaging, and all that good stuff of the VC1000. For me the cable was flexible enough to use them over-the-ear without guides. I had to make a DIY cable cinch out of some tape, though. Phonak and Meelec both don’t seem to stock cable guides anymore, and those are the ones I still use. V-Moda (http://v-moda.com/sport-earhooks/) and Thinksound (http://store.thinksound.com/product/active-ear-hook) have good ones also, but they’re pricy at $8. Ebay ones should be fine as long as they’re tight enough to hold on to the VC1000’s thin cable. Oh and no foam tips that I’ve tried fit. It seems to between Comply sizes and too big for Westone and Shure foams. Thanks! I ordered some from Thinksound (they have free shipping haha). Good to know about the Dunu DN-2000, sort of considered the Dunu DN-1000, but thought the VSonic might end up being better value. Am definitely curious about hybrid drivers like that. Having a lot of fun hearing all sorts of sounds from the VC-1000, been listening for 4 hours straight. That’s what this hobby should be about. Enjoy! Loving the VSonic VC-1000. I’m still a newbie at this hobby, so had a quick question about headphone amplifiers. Other than boosting volume, I know that it can also enhance clarity and boost other things. I mostly listen to music out of my Macbook, iPhone, and iPod Classic, is there a need to get a headphone amp for my VSonic VC-1000 or any other headphones? What do I gain from it other than what I just mentioned? Browsing through head-fi a bit, it seems like the Fiio E12 and the C&C BH are recommended units? Are any amps that are cheaper also serviceable, like the Fiio E6 for instance? I’m not necessarily thinking of getting a DAC in addition, I just wanted to know if an amp alone would be a worthwhile investment. I know I can browse through head-fi for hours, but was wondering if you could just give me a brief answer as I value your opinion. Thanks! Amplifiers are a very complex topic with a lot of things to consider. If you want a deep look at the ins and outs, check out NwAvGuy’s blog. My two cents are below. Amps are certainly not some magic panacea for all headphone shortcomings, as some might have you believe, and there’s no blanket reason to advocate the use of an amplifier. They really don’t enhance clarity as such, for example. Instead, I think of an amp or even amp/DAC as a way to make sure there’s no damper on what your headphones or earphones are already capable of (it’s much the same story with other parts of the chain, such as the quality of your music files). So if you’re using a crummy source – for example one with a high noise floor or high output impedance – you might see a very sizable improvement with an amp. Output impedance is especially likely to make a difference with armature IEMs due to many of them having non-linear impedance. My experience is that TWFK-based earphones like the VC1000 don’t react positively to sources with non-negligible (above 2 Ohms or so) output impedance. The iPhone and iPod are good on that front as far as I know. Not sure about the Macbook. Anyway, it is my opinion that in the absence of a flaw with your source(s) that can be remedied, there’s little reason to invest in an amp with the VC1000 and most other IEMs and portables. The fact that you’re using multiple different sources does make a DAC/amp combo somewhat appealing but on the other hand Apple products are known for consistently good audio hardware. The other exception is if you want to try something with a bass boost function, though you can probably get similar results with a parametric EQ with a lot less expenditure and potentially less inconvenience. Thanks for the advice. After reading about it on Head-Fi for several hours, the objective truth seems to be that it just amplifies the volume and can give headphones that require the additional power a boost, which seems more likely with cans than IEM’s. The amps that seemed most intriguing given their price are the Topping NX-1 and the SMSL SAP 5. If you were to run an Fiio LOD cable from an iPod to one of these amps, would the sound receive a boost because the signal is technically more “pure”? Or, are Apple products good enough where this isn’t really much of an enhancement? As for DAC/Amp combos, is the Fiio E07K Andes worth an investment? Or again, are my Apple products just fine and should I just not bother? I love the clean sound of the VC-1000, so boosting the bass isn’t that much of an interest to me. As I said above, it really depends on who you ask. There are always people who hear a night and day difference between lower- and higher-end sources and amped vs unamped iPhones. I do not, although I don’t have the amps you are talking about. The E07k is a great little device, I use it often with my PC, but I wouldn’t bother carrying it around if I had an iPhone. If you’re that worried about it the best thing to do is get an amp or amp/dac and try it out yourself. If it sounds better, or even if you just think it sounds better (placebo effect or whatnot), you’ll have your answer. Am interested in picking up a pair of Vsonic but undecided on which model? Between the VC1000, the GR07 Classic, the GR07 Bass, how would you rank the three? And how does the HiFiMan RE400 compare? Thanks, your site is incredible. They all have their place – the VC1000 is the flattest of the bunch and my personal favorite. The GR07 is a little more v-shaped – that is, slightly bassier and with less midrange presence in comparison. The GR07 BE is almost identical except for having even more bass. The RE-400 is more mid-focused, with less emphasis on bass and also smoother, more relaxed treble. Thanks for the quick reply. I guess I’ll narrow it down to the VC1000 and the GR07BE and pick between whether I want a flatter sound or more bass. I generally listen more to popular music (hip hop, rock, pop, etc), so maybe the GR07BE is a better choice? Put in a dumber way, maybe it’s the more “fun” choice? A case can be had for the GR07 BE being more fun :). To put it another way, the regular GR07 can be seen a something of a compromise between the GR07 BE and VC1000 (though closer to the GR07 BE of course). One last question, I promise haha. Are the new classic GR07 the same in terms of sound quality as the GR07 BE? I know they’re supposed to be very close to the original GR07. Ugh, sorry to bother you one last time. As a reference, I’m planning to make a jump up from the Brainwavz M2 (I know it’s nowhere close to the VSonic’s, but I think it’s decent value for the price). I don’t listen to much classical or jazz, so it’s mostly popular music I listen to, I’m tempted by the VC1000 because it might have slightly better isolation and might be a touch better in the sound department, but otherwise the GR07’s might fit better with the music I’m listening to. Final thoughts? And again thanks for the help. You’ve actually been very clear, I’m just second guessing myself. None of the sets you’re considering share the warm and smooth sound signature of the M2. I guess unless you’re especially worried about treble smoothness, the GR07 is the “safe” choice over the more analytical VC1000. I’m not necessarily looking at the VSonic’s to replace my Brainwavz M2, so maybe I’ll go for the VSonic VC1000 as an alternate set of earphones. Perhaps I’ll come to favor the sound after listening with them. In any case, thanks for the help. You’re doing excellent work on this site. As they are tuned quite differently, it really depends on what you want – a fairly bassy sound with good mids and highs, or a flat, reference-tuned earphone. I prefer the VC1000 because I want the latter. Neither really has an advantage over long periods in terms of sound, but the VC1000 is lighter and more comfortable. Why have they stopped making this model? Yeah, good question. It’s one of my favorites, but it seems like VSonic is moving away from armatures entirely. I purchased these and these aren’t too bad. They had lots of static on my iPhone on most songs mainly on my hip songs or any sounds with a heavy bass. I had to change the equalizer the vocals are more clear but still sounds a bit low. I had my hopes up with these but just not a taker for me but worth the price. I also had to be careful with these. The earpiece breaks off easily with handling the earphones. I know a lot of people have been asking for comparisons. But could you please compare the following? I am leaning towards the Vsonic VC1000 because they appear to be the most balanced and most similar to Etymotic Research IEMs. But as I read back and forth of your descriptions of their sound, it does feel a bit arbitrary and that all three of them are very balanced. My preference is towards balanced, analytical and neutral with just a hint of musicality for fun. A wide soundstage is also crucial for me. I don’t mind if it lacks booming, impactful, “Beats”-like bass, as long as it extends deep and is accurate. To give you an idea, I’m owned over a dozen headphones: from a budget Coby CV-185 (thanks to your headphone shootout thread in HeadFi) to my most expensive, an Audio Technica M50 (which I regret purchasing and sold a few months after). My favorites remain to be the Superlux HD668B and HD669 because of their inherent balance, wide soundstage, clear imaging, and versatility with an EQ. Nearly all of the other headphones I’ve owned or tried are nowhere near as versatile with an EQ. My favorite headphone would be the Sennheiser HD600, which is unfortunately too expensive for me. My current choice of IEMs are the Philips SHE3590 and Sony MH1C, which are both EQ’ed to neutralize them. My favorite IEM would have to be the Etymotic Research ER6i, but it’s been forever since I’ve heard them. The VC1000 really seems to fit the bill, but where I’m from, I can’t return an item simply because I’m not satisfied (sigh, lucky bastards in the USA). There are no stores that would let me audition them before purchasing either. I would really appreciate your input on this. To be honest, I feel like I should just purchase an Etymotic Research HF-5 according to your review and description of the sound, but I can’t find them locally. They are all *very* similar-sounding earphones. My pick out of those is the VC1000, which is a little less bright and has my favorite tonal character of the three, followed by the B2 and then the modified R-50 which are about even for me. The R-50 you can order directly with the manufacturer, though, so you might want to check with them regarding returns. If they allow returns, that might swing the scale in the R-50’s favor. Otherwise as an ER6i fan I really don’t think the VC1000 will rub you the wrong way. Many thanks for the prompt response! I’ll go for the Vsonic VC1000. Can you do a comparison between the W2 and the VC1000? I’m interested in knowing which has more forward mids; better, but non-fatiguing highs; and better quantity and quality of bass. I’m essentially transitioning from a Klipsch S4, however, I have tried the Shure SE215, Westone 3, and now the Yamaha EPH-100 and each has flaws I cannot get around. The Shure was disappointing in that I didn’t find it to be anything special and the highs seemed too rolled off. The Westone 3 had a great soundstage but the bass impact and bright treble became fatiguing after a short time (interestingly, though, my ears didn’t get tired of the S4’s highs). I also found the mids to be a bit too recessed on the Westone 3. The Yamaha has come closest in overall sound but the bass impact was also too much on a portion of the stuff I listen to (mostly house and techno) and the aftermarket foam tips that gave them best sound start to hurt my ears after an hour or two. The vocals and mids could be just a little more forward as well. I think both have tight, accurate bass and pretty forward mids – no recession. The W2 definitely had more relaxed/non-fatiguing highs though. Be aware that these both have significantly less bass than all the IEMs you’ve had so far – they are pretty flat/neutral through the bass region whereas the S4, SE215, W3, and EPH-100 are all bass-heavy.